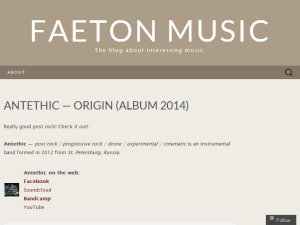 The blog about interesting music of all styles and genres with daily updates. This what your The blog about interesting music Blog Ad will look like to visitors! Of course you will want to use keywords and ad targeting to get the most out of your ad campaign! So purchase an ad space today before there all gone! Today I am here with fresh stuff by Reyn Hartley. For those people, who don’t know what’s going on here – Reyn Hartley is hip-hop / rap artist from New York, United States. Previously I posted his track called “Snitch”, you can check it following link below. As usual, his stuff making me happy :) I can listen to it on repeat. Recently I already posted this incredible band from Uzbekistan (check out link below). But here we go again! New song by NEEDSHES. This time it’s much more rock. I even hear influences of Korn in some intonations of vocalist. Well, this is very-very successfull mix of pop, rockand indie music. I really like their music. Will wait for the next releases. If you didn’t hear about Lyhre before, then I strongly recommend to check out links of their previous releases below. And yes, track itself is incredible! Just check it yourself. Here I am again, and today I want to represent to you an incredible artist – Sarah Lew, from Copenhagen, Denmark. Her music is a mix of indie, electronic, alternative and even trip-hop styles. I really dig it and I think now I have one more artist to follow and listen. Maybe this track even too calm for a working day, but I strongly recommend to check this out. If you are the owner of The blog about interesting music, or someone who enjoys this blog why not upgrade it to a Featured Listing or Permanent Listing?